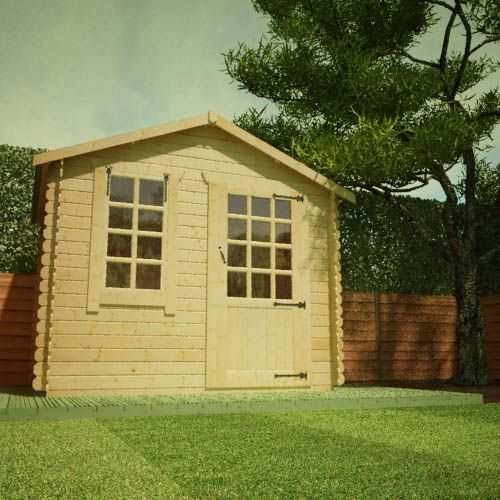 Sit back, unwind and enjoy the beauty of your garden building in the amazing White Label Olympia Log Cabin. 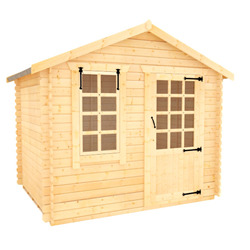 This compact yet stylish Log Cabin is the first of the White Label range offering high quality products at some of the most competitive prices around. Absolutely thrilled with my Olympia log cabin. Great quality - good communication and spot on delivery. Would definitely recommend and use again in the future. Excellent service with helpful delivery. The shed is more solid than I expected the 19mm walls to be. I chose this model because my concrete base isn't perfectly level, and unlike thicker walled cabins, this sits on the base so is a bit more tolerant. One downside is the floor beams aren't tanalised or treated, so we treated them with Creocote first. Walls, door and window too 2-3hrs to build (me and the missus - we aren't great at DIY so shows how easy it was). 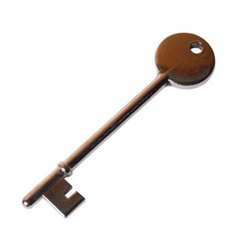 You can't go wrong - it's very simple. A few boards needed coaxing into position but a gentle tap with a pound-shop rubber mallet did the trick (I strongly advise you have one handy). Roof took another couple of hours. We added a couple of vertical strengtheners (20x30mm wood - on the inside) to add more support to the pre-built gable ends, but otherwise left as is. The door was slightly off true (because our base isn't perfectly level), but a few minutes with a cheap plane sorted that out. We paid extra for glass for the windows - and added some internal bars to make it look a bit better. 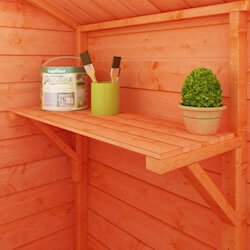 Painted with external wood paint (from Wilko) as we wanted a true colour rather than stain. Whole thing looks brilliant. Very pleased. Would heartily recommend both product and company. The log cabin looks fantastic, we also had the tiled roof which really finishes it off. So pleased we ordered with Tiger sheds, the whole process was smooth and speedy. Our cabin was delivered within 6 weeks which was stated when we ordered and we had it built within the weekend by the two of us. 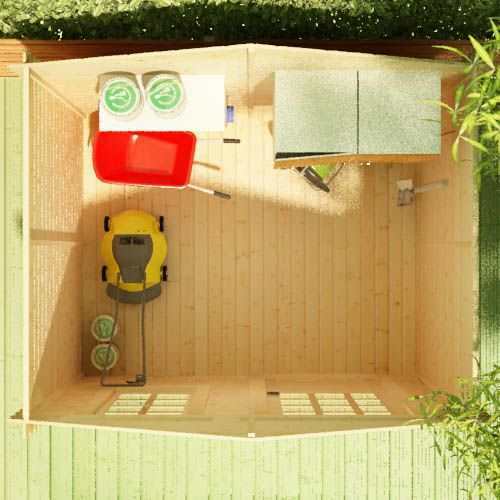 I can't recommend them enough and have already ordered our new shed too. overall i'm very pleased with this log cabin. 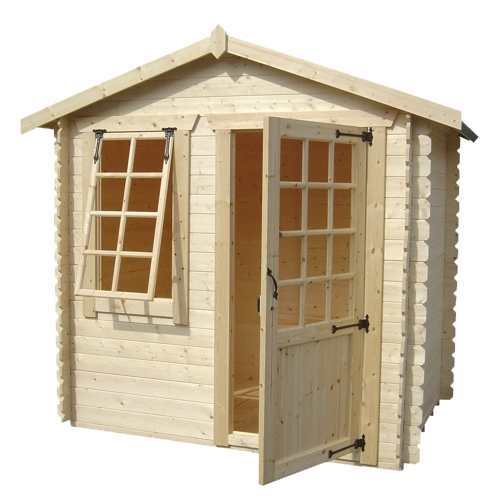 it's attractive in the garden and much more robust than a traditional shed or summerhouse. the only reason it didn't get 5 starts was because of the flimsy plastic windows, but i might get some glass made for that in due time. apart from that, i am very pleased. i opted for the red shingles on the roof which makes it look very nice indeed. I wanted to add a bit of indoor space to the back of my garden and decided to buy the olympia from tiger. I chose an 8x8 model and called the sales team to put the order through. The whole process has been easy and the staff were more than happy to help and offer advice. Excellent service and an even better product. 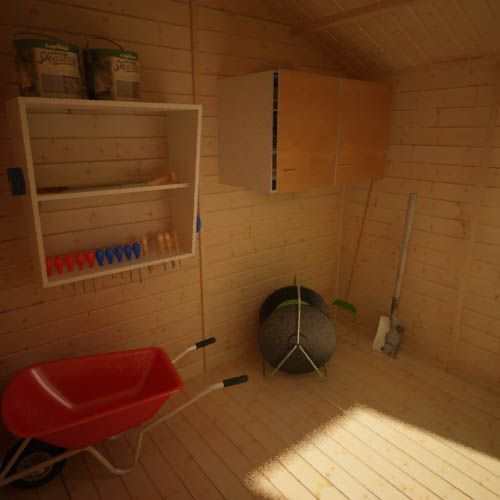 I bought this cabin as an 8x8 for my daughter as a little retreat where she can go and have some space of her own. I have to say that this has worked a treat and it is an extremely well made product. The driver was polite and extremely helpful. Even for someone like myself with the most basic DIY skills I found it to be extremely easy to assemble. Great product, great company! I looked around and found that tiger offered the cheapest prices on the web for what I wanted, and after receiving the cabin, it is definitely of a higher quality than what I paid for. It only took a few hours for my husband to put it up. Thank you Tiger Sheds! Great product! Bought it for my wife so she could have her own space to make her own. 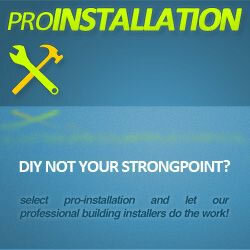 Easy to assemble and great customer service! 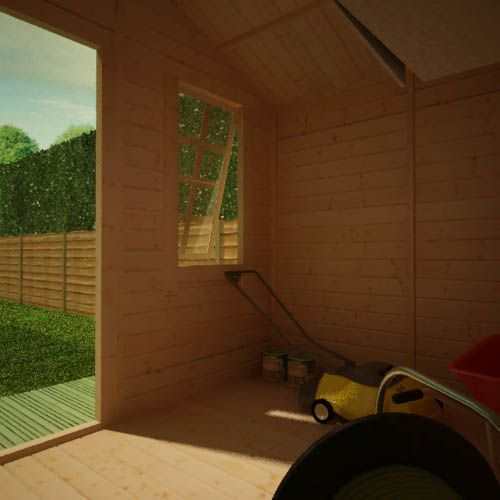 Sit back, unwind and enjoy the beauty of your garden building in the amazing White Label Olympia Log Cabin. 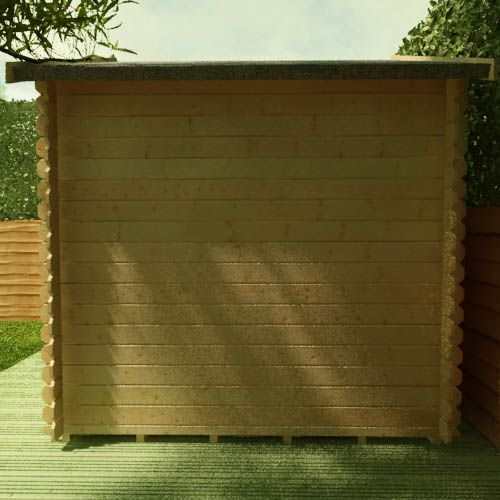 This compact yet stylish Log Cabin is the first of the White Label range offering high quality products at some of the most competitive prices around. 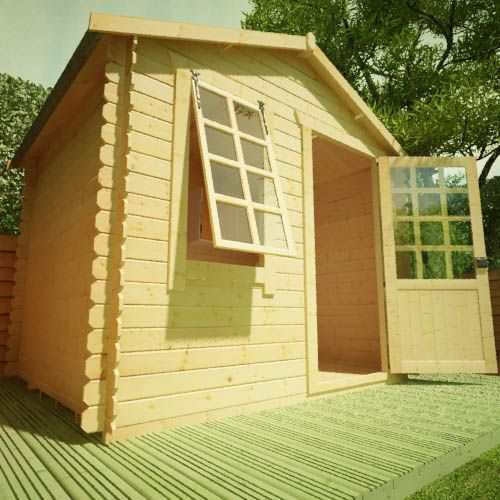 The Olympia Log Cabin is ideal for those yearning quality and comfort in a garden of limited space. The free Georgian style opening window and Georgian style door comes complete with a door pull and antique hinges which highlights the elegant beauty of this traditional English Summerhouse. The 19mm interlocking logs are complimented with pre assembled floor and roof sections which make for an easy installation. 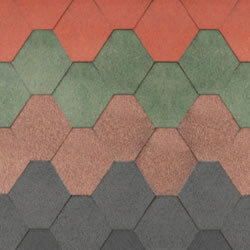 The Olympia Log Cabin features heavy duty green mineral roofing felt as standard. 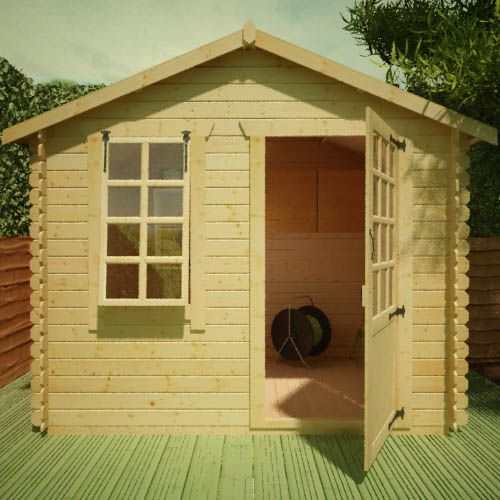 It is essential that this 19mm log cabin summerhouse is assembled strictly in accordance with the instructions supplied on a firm and level base constructed from a suitably durable material. It should also be treated as soon as is practical after assembly and then annually thereafter with an appropriate high quality preservative. For more information on how to correctly assemble and maintain your garden log cabin please consult our comprehensive help centre.